Maybe you want to remove your lawn. Maybe you want to reduce it to make way for flowers, food or a shade tree. Maybe you don’t know what you want. A new book, written by three of California’s most knowledgeable horticulturists, lays out options. 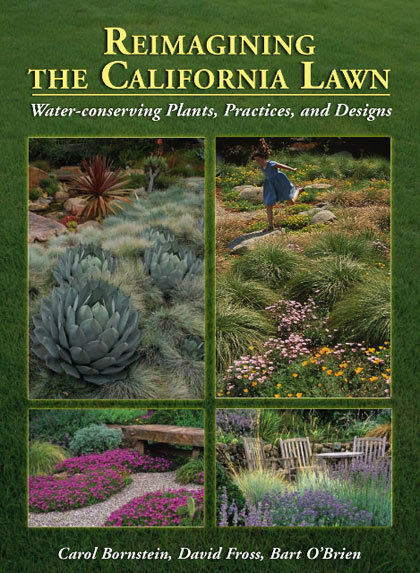 It would be disingenuous to treat Reimagining the California Lawn (Cachuma Press, 2011) like any other garden book. It’s not. The authors have close to rock star status in the Golden State, something they possessed even before the 2005 publication of their first book, California Native Plants for the Garden. Carol Bornstein, now a Central California garden designer, was for many years director of horticulture of the Santa Barbara Botanic Garden. The heart-stoppingly beautiful meadow there is her work. In 1976, David Fross co-founded Native Sons Nursery in Arroyo Grande and has since been the Johnny Appleseed of dry gardening. For many years director of horticulture at Rancho Santa Ana Botanic Garden in Claremont, and now its special projects director, Bart O’Brien is among the most knowledgeable plantsmen in the country. Once, when researching a piece for the Times and cold-calling a homeowner with a dry garden, I mentioned that O’Brien was outside. She screamed as if he were not one person, but all four Beatles, straight from Liverpool. Click here keep reading this review of “Reimagining the California Lawn” in the Los Angeles Times.